David Woodcock is a native of Washington State, having grown up in the Seattle area. 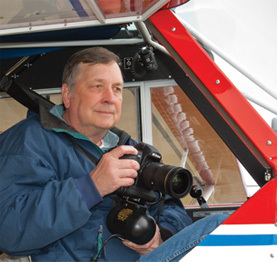 He has over forty years experience flying general aviation and experimental aircraft. His award-winning aerial photography has taken him from the Pacific Northwest to above the Arctic Circle in Canada and from Alaska to the canyonlands of the American southwest. His images include traditional landscape and wildlife photography as well as aerial work. Dave's first book publication came in 2008, as photographer of Totem Poles of the Jamestown S'Klallam Tribe: The Art of Dale Faulstich, published by the Jamestown S'Klallam Tribe. His second book, From the Air: Olympic Peninsula has been published in March of 2010. Dave graduated from the University of Washington School of Dentistry with honors in 1971. He spent three years as a dentist in the U.S. Air Force and then opened his office in Renton, Washington, practicing there for thirty two years. He is still actively involved in dentistry on the Olympic Peninsula. David Woodcock with his photographic equipment in the Aviat Husky A1B aircraft.